Taste becomes an experience, while shopping at the weekly market, stirring cheese on an Alpine pasture or visiting a farm shop. If you know where the food comes from, you enjoy it all the more. The close relationship between farmers, producers and hosts is ever-present in SalzburgerLand. Whoever really wants to know what is sitting in their shopping cart, goes directly to the producers, buys from the farm shop just around the corner or visits one of the popular markets in the town and province of Salzburg. The people of Salzburg are well aware of their favourable location. Depending on the day of the week, they get fresh vegetables, bread, eggs, meat, fish and all their daily needs at the Schranne, the green market or directly from the farm. Even experienced chefs also know to appreciate this gift. They are the first to make their early morning shopping trips in order to really get the best ingredients for their dishes. So, more or less straight from the field into the kitchen and onto the table – it doesn’t get fresher than that. You can taste the passion for the produce along with the care and the joy of food. This special food culture is a celebration of enjoyment. Whether up on the Alpine summer hut or in one of the colourful Salzburg Harvest Festivals, people come together over food to enjoy, philosophise and taste. The weekly visit to the Salzburg Schranne is eagerly anticipated by many connoisseurs in the weekdays beforehand. Since 1906, this market has taken its rightful place in the hearts of the locals. Every Thursday between 5 a.m. in the morning and 1 p.m., gourmets bustle about with their baskets, around the imposing St. Andrew’s Church close to the Mirabell Palace, always on the lookout for the finest produce. Fresh milk, fine cheese and a juicy loaf of bread drop into the basket along with just picked fresh fruit and vegetables. In between, there are small snacks such as fried chicken, farmer’s doughnuts, local organic fish soup and fine sausages from the local butcher’s shop. Even older than the Schranne is the Green Market which sits on the right side of the river in the heart of the City of Mozart. The stalls stretch from between the Festspielhaus Theatre and Getreidegasse, and extend over the full area of the University Square. This all-day market is open from Monday to Friday and also on Saturday, and for the people of Salzburg is a so-called show of their trust in the Green Market and its produce. This colourful market on the University Square is well worth a visit at any time of day and for those strolling through the City of Mozart, you can’t miss it. Aside from the farm produce such as fruit, vegetables, dairy products, meat and fish there are also handicrafts, flowers and fine delicacies on offer. When touring through the market, make sure to stop-off at the sausage stand. Market shoppers gather here for a nice chat, whether with a Frankfurter or Debreziner, with horseradish or without, before continuing with the shopping. Organic farmers have their fixed stands both at the Green Market and at the Schranne. A separate market for organic connoisseurs can be found on the Kajetanerplatz every Friday morning. Selected organic stands sell fine produce from organic farm butchers, organic bakeries and homemade organic cheese as well as just picked fresh vegetables and succulent fruit. 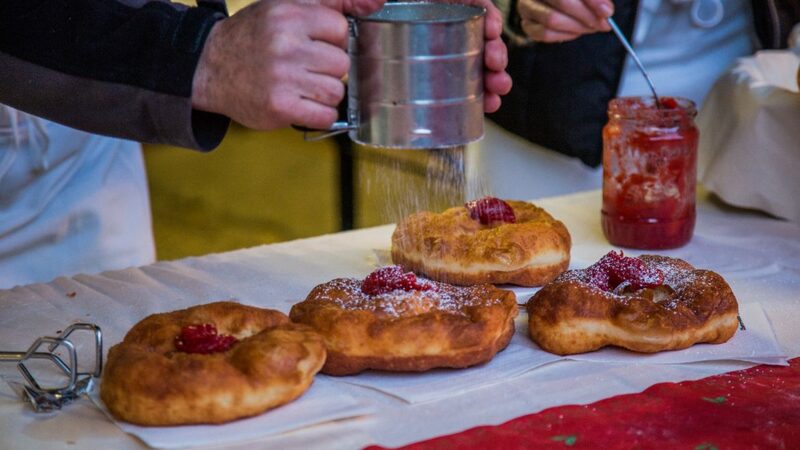 Throughout the city and province of Salzburg, these farmers and weekly markets offer their home-made delicacies. More directly than at a farmers market, cooking enthusiasts and gourmets can get their produce straight from the farm. What was previously taken for granted has experienced a Renaissance in recent years – buying one’s everyday goods in the neighbourhood. It’s easy, really good and at a quality that no supermarket can compete with. In addition to the basic ingredients for fine dishes, many farmers offer their own home-made specialities such as farmer’s doughnuts, fine pastries, dumplings and other delights for sale. With plenty of time and no pressure, there is also the chance to speak with the farmers about the origin of the produce and all kinds of other interesting things to learn. And for those who cannot offer their produce directly from their own farm, they join the communal farmer’s grocery stores. Good examples are the Pongauer farm shop or the Ehrentrudishof farm shop which specialises in organic produce, near the Hellbrunner Allee in the city of Salzburg. There is also lots of organic produce available in the Rochushof in Maxglan. This contemporary farm shop is well known as the premier source for organic shopping. 29 organic show farms in SalzburgerLand invite you to come, marvel and join in. Whether extracting honey, stirring cheese or walking through the herb garden – this is how organic is experienced. Where does the Alpine cheese get its lovely spicy aroma? How does the bee honey taste from an urban apiary? And what is the secret behind this wonderfully crusty bread? On the subject of organic, Salzburg farmers are European champions with their unrivalled high density of organic farms being second to none. Values such as sustainability, connectedness to nature and the preservation of cultural landscapes and the associated biodiversity are important to the organic farmers. These particularly hospitable farmers are happy for you to watch over their shoulders and open their doors and gates to you on these 29 organic show farms. All of them are certified according the strict criteria of the Bio Austria standard. A good example is Claudia and Hans Dirnberger from Seeham, who offer visitors an experience on their approx. 8,000m² large organic nature garden. The variety of delicious healing herbs, the wild shrub hedgerows and the healing Bach Flowers dominate the landscape around the idyllic courtyard. The herbs, wild plants, buds and roots are harvested by hand and processed according to the ancient knowledge of Traditional European Medicine. 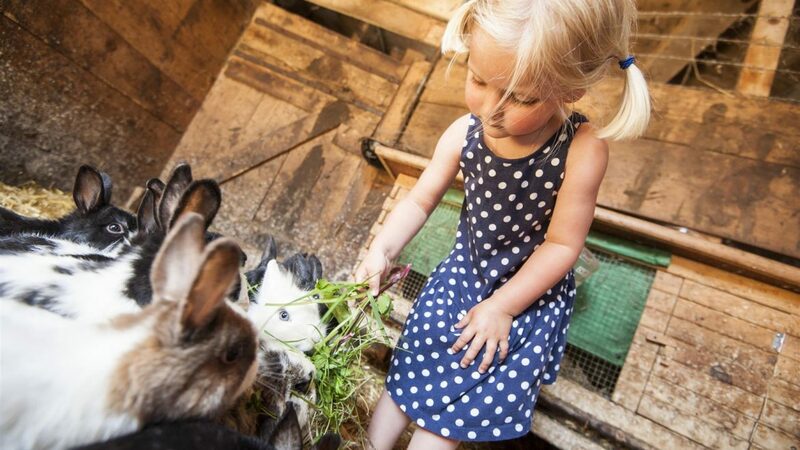 The little discoverers really enjoy an excursion to a show farm because the experiences offered are especially for children. Such as with Aicherbauer in Seeham, who is known among the locals for his hospitality and who lovingly crafts wooden sticks specifically for children together with his wife Johanna. Nature-loving children and adults really enjoy the Bienenlieb organic beekeeping. How does the honey get from the flowers onto our breakfast bread? What flowers do the bees like best and where do they find their flowers in this young city apiary? These and many other such questions are answered by beekeeper Daniel Pfeifenberger. Liesi and Peter Löcker dedicate themselves to the conservation of biodiversity and the almost lost treasures of their homeland. On their Sauschneider farm in St. Margarethen in Lungau, they show their guests what wonders are hidden in the small grain of Lungau Tauern Rye. Careful processing results in gorgeously, juicy bread and its tastes even better when you help the farmer bake the bread according to an old recipe.